I can’t get enough of the new mint balls! Cacao Mint Protein Bomb, they are fantastic, I could eat them all day. 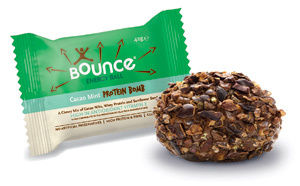 These, and some of the other flavours of bounce balls, have been my early morning, pre workout, commuting breakfast. A bounce ball and a cup of coffee for the long drive to work. They are a great way to start the day, especially when when you dont have the time to sit and have breakfast. And the new Cacao mint! I really have to stop myself from just eating the whole box, they are so moreish.